When I was four years old I went to a fancy dress party dressed as a 1920's flapper girl. Looking back at the photos, the costume was great . . . but as I had no idea what I was meant to be - and I lost my long cigarette holder :( I was not a happy flapper. Every toddler knows the popular Channel 5 cartoon character, Peppa Pig, so if you're looking for a pair of fancy dress costumes for siblings / twins that are comfortable to wear, inexpensive and instantly recognisable then look no further. All the other toddlers at the party (and their mums) will be green with envy!! Little girls will love this Child Peppa Pig Costume which includes a red top with a blue and pink Peppa Pig logo printed on the front and an attached pig hood with a stuffed snout which fastens under the chin with velcro. The finishing touch for this costume is a yellow teddy bear accessory that can be removed from the pocket. The Child George Pig Costume is perfect for fans of Peppa Pig's younger brother! The outfit includes a white and blue striped top with an attached pink hood and stuffed snout. Also included is a black pirate hat with white skull and crossbones on the front and a black eye patch. 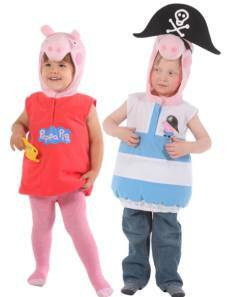 Both costumes are one size only costumes suitable for children 2-4 years of age and cost just £11.99 online. Ideal for friends / twins / siblings.